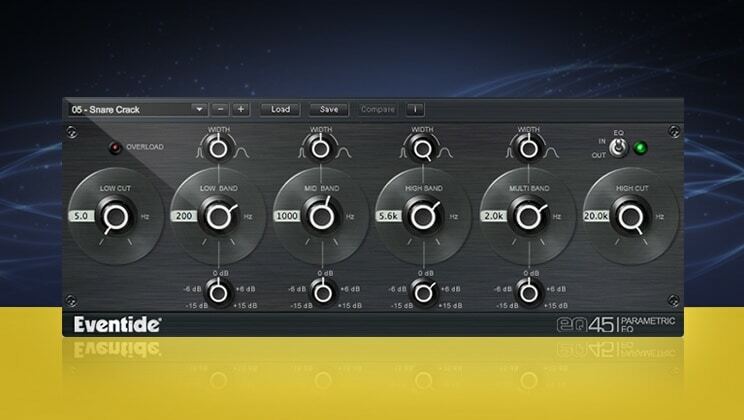 The Eventide EQ45 equalizer is a powerful audio engineering plugin that offers an elegant and easy to use environment to perform myriad types of frequency-based signal processing. It is based on the circuit model of the Urei 545 parametric EQ. The EQ45 is an accomplished four-band parametric equalizer with high- and 1 low-cut filters, width and gain controls for each frequency band, and an overload protection mechanism. It boasts a streamlined, easy to use interface, seamless integration with various plugin hosts, and Eventide’s legacy of quality design and accuracy. How Does The Eventide EQ45 Work? Eventide’s EQ45 is a lightweight, stand-alone parametric equalizer that allows you to gracefully shape the contours of an audio signal by boosting or attenuating its frequency components. The high resolution and flexibility of its filters and the wide number of parameters offered by the user interface enable you to perform subtle or drastic changes to audio material without the unpleasant artifacts that can often result from limited dynamic range in hi Q filters (single precision arithmetic). You’ll be amply rewarded with sounds that transcend the ordinary. High-cut and low-cut Butterworth filter sections, with attenuations of 12 dB/octave beyond their respective -3 dB points. An overload protection mechanism that responds when a signal’s transient extends above -0.1 dBfs. An EQ In/Out toggle. Click the object to enable it and to use the full suite of parametric filter; disable it to use only the high- and low-cut filters.